Experience an authentic fishing excursion in the unspoiled wilderness of Alaska’s coastline. You’ll be outfitted with waterproof boots, bib overalls, hooded jacket, hat and gloves. Then, glide into a breathtaking landscape aboard a stable, custom built, skiff. Cast a line, and what you catch will become the fresh center of a gourmet campsite meal! With only five guests per boat, your professional guide customizes the excursion to fit your interests and skill level. Along the way, we often see seals, eagles, whales, birds, porpoise, spawning salmon, and even bears. With quality fishing gear, hone your skills landing a variety of rockfish, cod, or Pacific halibut. After fishing, the skiff heads to a remote wilderness campsite, where a crackling fire awaits in the rain forest of ancient cedars and spruce. Here, you’ll enjoy a gourmet meal of your own freshly caught fish, served atop a saffron-infused, bouillabaisse-inspired stew (no shellfish). Savor sourdough rolls with garlic-aioli spread, a signature rhubarb and blueberry bread pudding, and steaming mugs of coffee or hot chocolate. You’ll leave having experienced the Alaskan way of life. Maximum of 4 passengers allowed on this tour. 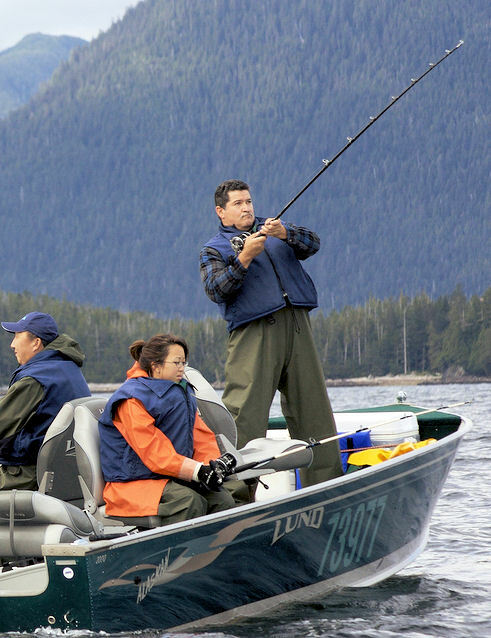 All guests sixteen or older must purchase a one day Alaska fishing licenses. Licenses are purchased at our marina and are $20 each. Guests must bring cash and a photo ID for the license. Maximum of 4 passengers allowed on this tour.